This week, as mentioned by Metblogs Los Angeles' Julia Frey (The Militant briefly opens up his raised, clenched fist to wave "hi"), the Docuweek film festival currently at The Arclight is showing screenings of The Wrecking Crew, a truly awesome documentary about an informal collective of unsung Los Angeles studio musicians who performed the music to some of the most legendary rock tunes ever recorded in the 1960s. The Militant was fortunate enough to see a free screening this past June as part of California Plaza's Grand Performances in Downtown (as usual, he will only tell you about his whereabouts after the fact). Without going into too much detail, the film was the Los Angeles version of Standing in the Shadows of Motown, albeit with a more personal (the film was directed by the son of one of the musicians) and historical angle to it (Go see it, folks, it's Militant Approved!). Literally just a few blocks down Vine Street from the Arclight was Gold Star Recording Studios, a facility that once stood on 6252 Santa Monica Blvd. Built in 1950, it was the place on this entire planet Earth from which songs such as (Pacoima local!) 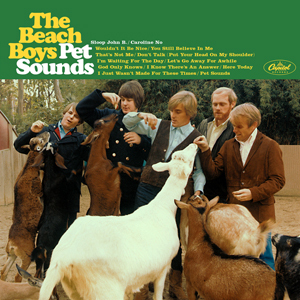 Richie Valens' "La Bamba," Sonny and Cher's "I Got You Babe," The Champs' (Los Angeles locals) "Tequila" and a great deal of the equally legendary Pet Sounds album from The Beach Boys (Torrance Hawthorne represent!). Members of The Wrecking Crew played for those recordings, and much much more. Now, forgive the Militant as he rambles about Pet Sounds for the duration of this paragraph. Though it's not of his generation, the Militant got into it during his college years and instantly felt "in tune" with the whole vibe of the recording. To the Militant, its wistful moodiness and echoey orchestral timbres created a virtual aural window into the Southern California of the mid-late 1960s, conjuring up images of large automobiles driving in the then-uncongested streets under sunny, yet slightly hazy kodachrome skies. Not that the Militant longs for those days, but that the music and voices from Brian Wilson and the rest of those Torrance Hawthorne boys evoke such images. The same album that Sir Paul McCartney said was the inspiration for the Beatles' Sgt. Pepper's Lonely Heats Club Band, which he felt was still inferior to the Beach Boys' product. Made in Los Angeles, folks. End of ramble. The studio lasted until 1983 and the building was destroyed in a fire in '84. Predictably, yes, a mini-mall stands there today (pictured left). The same location where some of the greatest tunes in rock history were created is now a place where Philly chessesteaks are made (Okay quit the chuckling, all you transplanted Philadelphians). 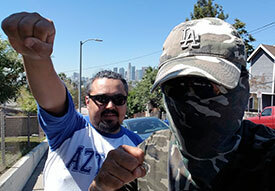 The Militant recently paid homage to the site, trying to picture a hazy kodachrome day where Brian Wilson or Herb Alpert or Sonny Bono or even this guy would step out of some large, bulky automobile and walk through the studio's front door. But wouldn't it be nice? The Wilson brothers were from Hawthorne, dude. Their childhood home was leveled to build the 105. Peter McFerrin: The Militant stands corrected...But do understand he's just the Militant Angeleno, not the Militant South Bay-er. Anonymous: In love with what? Long-defunct recording studios? The Beach Boys? Philly Steak Depo? Anonymous: But the words won't love you back (The Militant learned the hard way...). nonsense! every new post is like a whispered "i love you". this blog makes a lil local gal happy. anonymous: Wow, thanks. The Militant never knew he...er, his words can have that effect. The Militant gives much reciprocated love to all the Militant Angelenas out there, awww yeah. Wow - I drove by there just a few hours ago. I saw the movie & liked it a lot but didn't catch the exact location. we should conspire... you in? anonymous: Hmmmm...email the Militant privately. This could be, as Ackbar suggested, a trap to reveal the Militant. Pet Sounds was recorded in Studio Three at Western Recorders on Sunset Blvd. This is really a nice blog in which you discuss about the places where recording can be done. Thanks for posting this please carry on your posting. Militant Update: Wesson Will We-pave Western!